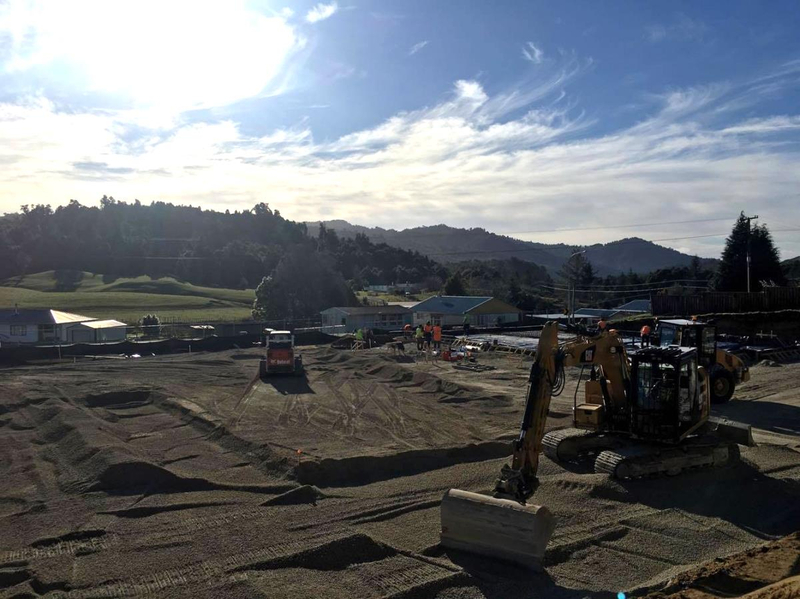 It’s always an exciting moment when you can say ‘we’re out of the ground’, meaning you’ve gotten through the bulk of earthworks, ground conditions are ticked off and you’re into foundations of the building. This moment is even more satisfying when your site has been hit by not one, but two cyclones; when the main access road has been closed due to slips and washouts; and when the soil under the building was found to be less stable than you first thought. Because of these circumstances, earthworks have taken longer than was planned. The earth was dug out to the level required under the café, store and office buildings creating what started to look like a swimming pool. At this point, the engineer tested ground conditions and found that the bearing capacity of the soil was much less stable than anticipated. To picture less than ideal bearing capacity, imagine that the building is a glass of water and the ground beneath it is a fresh, wet cow pat. This obviously needed to be made stronger. After considering multiple options, it was decided the best way forward was to bring in pumice to create a more solid platform. 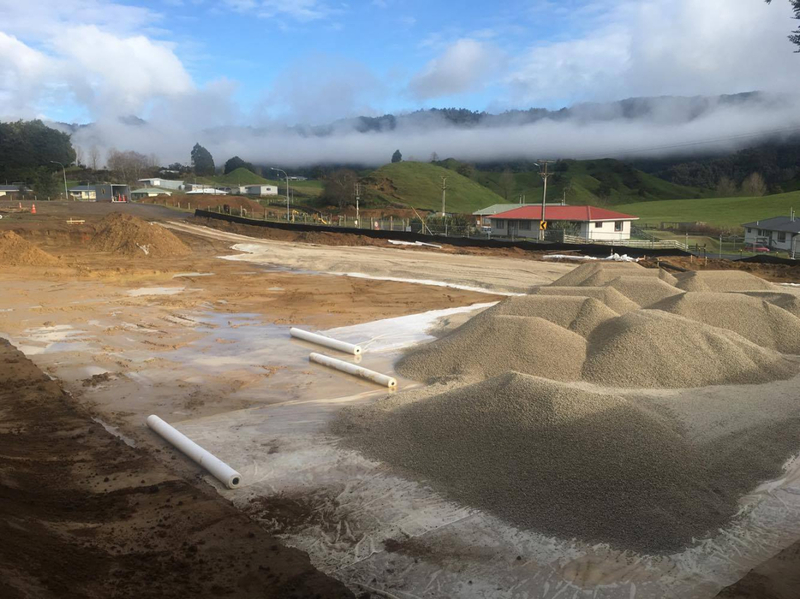 Given the state of the roads, we were only able to deliver two loads of pumice a day – but at long last, around 1500m3 and 960 tonnes later the pumice platform was ready for foundations to be set up. 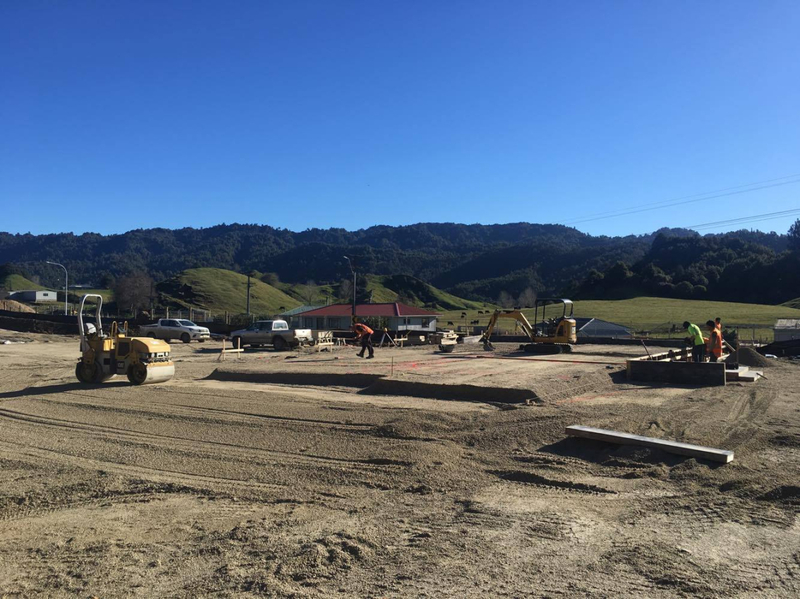 The team on site is ready for the first large concrete pour for the floor slab of the Tribal Office building. This was scheduled to take place on Saturday, but the current rain has beaten us again! The pour takes ALL OF FIRTH’S TRUCKS from Rotorua out of circulation for the day so they're coming at their next available date, this Thursday 29th June. The team has set up shutters which the concrete will be poured into (much like a cake tin) and laid a damp proof membrane which stops moisture rising from the ground into the floor. 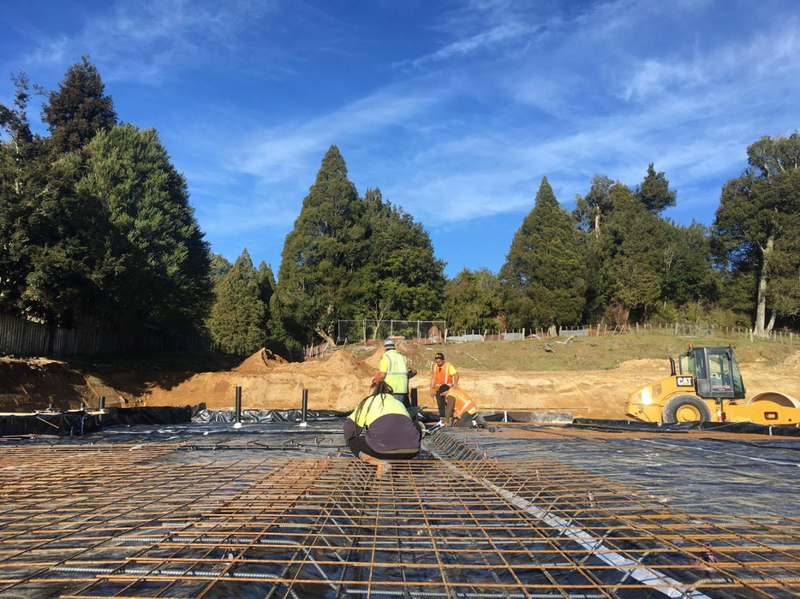 They've set up reinforcing steel which makes the concrete floor slab even stronger. This was inspected and approved by the engineer this morning. While the floor is drying, people are invited to come and place a handprint in the concrete at 1230pm on Thursday 29th June. The concrete will be covered up, so the handprints will be like a time capsule and a memory of those living in the area at the time. A silver lining from the cyclone delays is that while the great-pumice-move was taking place, the team on site was able to divert their attention to construction of the chalets, which wasn’t planned to start this early in the piece. Four chalets of varying sizes are nestled into the bush at the back edge of site. The team cleared only low shrubbery and trees necessary to locate the buildings with minimal impact on the ecosystem in the bush. This also means that the bush creates privacy for those staying in the chalets. Firewood was cut up and delivered to those who needed it most locally. Because the chalets are smaller than the other buildings, they’re supported on simple timber piles with concrete footings. 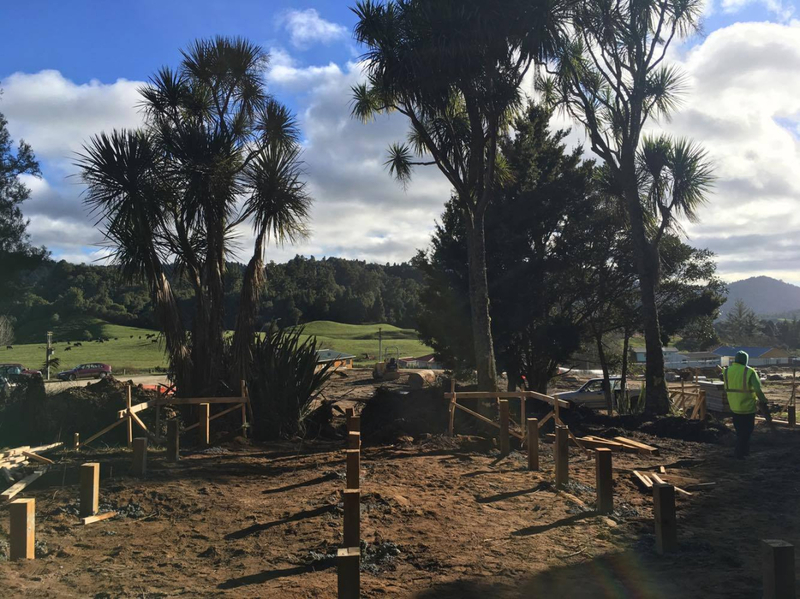 This photo shows one of the chalets timber piles and the view that will be experienced by those who stay there. 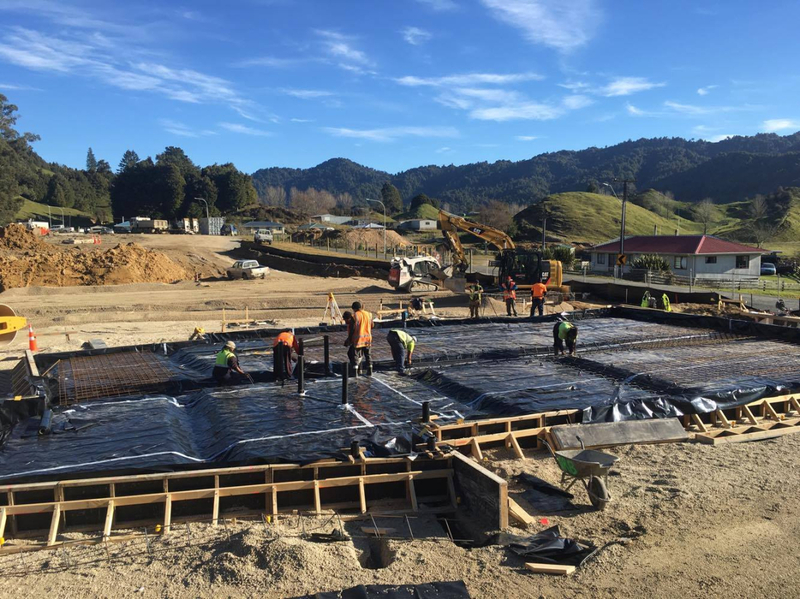 While some of the team are preparing for the concrete pour for the Tribal Office Building, others are preparing the pumice platform under the Store and Café building, shown in the photo below. The team will repeat the same process on the second floor slab and before we know it, we’ll be able to see how all of the buildings are located! Let us know what else you’d like to hear about in the comments below! E mihi ana ki te ataahua o ngā kōrero. Koinei ngā kaupapa pai hai pānui ki tō tātau iwi, e kite atu ai, e rongo atu ai, kai te pūāwai ngā moemoeā o te hunga kainga. E tūmanako ana i te moemoea e puawai ai i roto i ngā whakatinanatanga.